While sitting at the dining table the other day I glanced over to a corner of the room and was grossed out. I’ve been slacking on the housework for a while — first, a broken wrist, then — well — other things are more interesting, aren’t they? A more disciplined person would have abandoned her coffee and newspaper and leapt up to grab the broom and dust rag. But me — I went into my office and logged onto Facebook. This cartoon! The universe is conspiring. 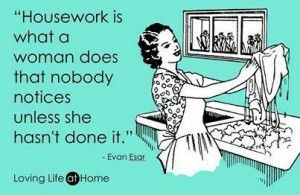 Housework is that way. Clean (okay, clean-ish) is normal at my house. I don’t notice clean. Everyone notices grubby. It’s the same way with compassion. Most people I run into are kind and thoughtful. I usually don’t notice until someone isn’t. The media report on the unusual. A day when everyone was compassionate would be considered a no-news day and I’ve never seen one of those. Here’s an example. There are about 93,000 children between birth and five years old in San Antonio. Every single day, 93,000 parents cuddle them, comfort them, feed them, change them and generally delight in their presence. Add in the grandparents, aunts, uncles, older siblings, cousins, care providers, neighbors — every minute of every day thousands and thousands of kids in San Antonio are getting love, love, love. In 2011, though, 19 children were killed by their caretakers. There were 6,000 cases of reported child abuse. It’s not normal. It’s the dirty little corner of the room. We need to grab our brooms and dust rags and clean that up. But we also need to remember the clean — the normal. Because it’s good. It’s very good. And then . . . grab the broom.